The most important step in my design process is understanding my couples taste and collaborating with them to identify the things that would create a unique design. I am passionate about reinventing traditional designs and believe what sets my work apart are the incorporations of my hand illustrations. I enjoy including these handmade touches to make the pieces truly one of a kind. With my BA in Graphic Design, I have been a professional visual designer for ad agencies, media publications, and small businesses. For over a decade, I have worked one-on-one with clients on projects from branding to ad campaigns. My experiences allowed me to build relationships with printers & suppliers inorder to take unique concepts and bring them to life as tangible items. Made Divine Custom Design services are for couples who want an unique, completely personalized stationery. They are passionate about details and value the hands-on and collaborative approach to design. We will explore creative, unique ideas that represents your personality and taste to excite your guests. 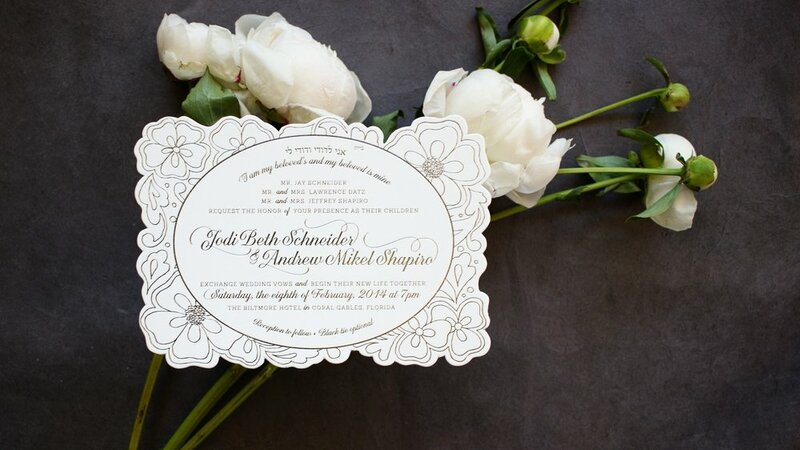 Custom stationery design services typically start at $3000 for a standard letterpress or foil stamped 100-count invitation set which includes the invite, reply, and details card with the matching envelopes. The final cost will vary based on the items that you will need designs for as well as the quantity of items produced, materials, and printing method. Along with a financial investment for the creation of your custom stationery, there is also an investment of time. Custom design of any nature requires ample time for development. Get in touch at least 8 months before your event date to secure a place on our production schedule and to ensure plenty of time for design and printing. Start by filling out the event questionnaire form with your event details including your ideas and inspirations. Once I receive your responses, I will reach out to you within 1-2 business days to schedule a phone or video consultation to discuss the scope and creative direction of the design. During the review process, you will have the opportunity to look over your proofs carefully and submit any changes/corrections. When the final proof is ready, you will have the option to receive a digitally printed proof of the approved items featured in your chosen design. Following the consultation, you will receive a customized proposal for your design. Once the design proposal is approved, you will be emailed an invoice for a portion of the custom design fee. Planning, sourcing materials, and design work will begin immediately. Once the final design is approved, an invoice for the remaining balance of the work will be sent to you. All items are produced based your requests. Press checks will be made by me with local printing vendors as the items are being produced for quality assurance. Once I receive your wording, I will work on the concepts of your custom stationery. You will receive drafts of the design concepts through your personal client portal. You will have the opportunity to provide revisions to your concepts until the final design is selected. When printing is complete, your items will be assembled, packaged carefully and shipped to you to share with your family and friends. I also offer services to stuff, stamp, and mail your invites directly to your guests as well as hand-off any day-of stationery to your event planner. Crystal helped us brand our event by creating our family crest. This was something we always talked about doing, so while planning our wedding we decided it was the perfect time to do so. Crystal was patient with us as I am very "picky". She gave us feedback based on what we wanted and the end result was amazing. Think We're A Match - Let's Chat!